A paper published today in Global Environmental Change finds that CO2 emissions are essentially self-regulating, that after countries reach a higher GDP level, CO2 emissions stabilize or even decrease, without the imposition of carbon taxes. According to the authors, "Evidence from recent four decades indicates that per capita carbon dioxide emission first significantly and monotonously increase at low income level and flattens after per capita income reaches at about 22,000 $ (2005 constant price)." "A 'first-rise-then-flat' relationship of carbon dioxide per capita and GDP per capita was found", which suggests carbon taxes are unnecessary to stabilize emissions in higher GDP countries. Historical carbon dioxide-GDP relationship was examined using a flexible linear spline model. 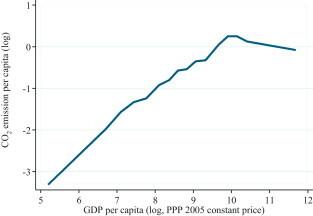 A “first-rise-then-flat” relationship of carbon dioxide per capita and GDP per capita was found. Conclusions are robust to model specifications, econometric methods and data sources. Issues concerning what measures should be adopted to achieve a sustainable world with less carbon dioxide emission and in what magnitude should we reduce our emission have been on agenda in both international negotiations and countries’ policy making aimed at coping with potential global climate change. These issues cannot be easily addressed unless comprehensive understanding about the countries’ status quo as well as historical relationship between economic development and carbon dioxide emission are gained. In this paper, we examine the historical relationship between economic development and carbon dioxide emission; the ex ante restrictions on function forms and the poorly handled robustness issues rife in economics literature are synthetically addressed. Evidence from recent four decades indicates that per capita carbon dioxide emission first significantly and monotonously increase at low income level and flattens after per capita income reaches at about 22,000 $ (2005 constant price). We perform various robustness checks by employing different data sources, different model specifications and different econometric estimates. The captured development–emission relationship is robust. Our empirical results indicate factors such as urbanization, population density, trade, energy mix and economic environment impact the absolute level of carbon dioxide emission not the overall income elasticity structure of carbon dioxide emission. JC comments: For the sake of argument, lets assume that the IPCC consensus is roughly correct regarding dangerous anthropogenic climate change, with the dangers becoming apparent in the latter half of the 21st century, and mitigation of CO2 emissions from burning fossil fuels is necessary, urgent, imperative (or whatever the latest word being used in professional society advocacy statements). How do you square this climate policy ‘imperative’ with the real need right now of the majority of the people on the planet for greater access to energy? Further, the potential development associated with increased energy could make these societies far more resilient to natural disasters (whatever the cause) than they currently are now. Not to mention that developed countries have lower population growth rates and pay more attention to their environment. Which imperative is more ‘moral’ – to insist on reduced fossil fuel emissions over concern about what might happen > 50 years hence, in a future world that we can hardly imagine, or to support energy equity in the developing world and concretely improve lives in the here and now? How would cost/benefit analysis of this tradeoff even be conducted? What is the ‘morality’ here? To those scientists that are advocating for a global emissions reduction policy, have you thought this one through (Jim Hansen seems to have)? This is one of the issues that makes the climate change problem so wicked. Who is paying for this blog? I am paying out of my own pocket with my time and expense of purchasing paywalled papers. I receive no external support whatsoever, no tips, no donations, no advertising, and have no financial interests related to this blog. My only connection to the fossil fuel industry is what I pay them when I fill up at the pump. So, take your conspiracy theories elsewhere. You seem to be confusing absolute CO2 emissions with rate of emission. Absolute emissions are not reducing - that paper suggests that the rate changes. So as population grows, so do CO2 emissions, albeit more slowly. They do not decrease, as you claim may occur. The CO2 emissions per capita stabilize or decrease. That is what the paper shows & what I am saying. To quote you, with ** for emphasis: "A paper published today in Global Environmental Change finds that *CO2 emissions* are essentially self-regulating, that after countries reach a higher GDP level, *CO2 emissions* stabilize or even decrease, without the imposition of carbon taxes." This is not the same as the paper is showing. The authors claim "Evidence from recent four decades indicates that *per capita* carbon dioxide emission..." The paper therefore talks about the RATE of CO2 emissions changing with GDP, not absolute emissions, which is what your post is implying (accidentally or deliberately). As I've already pointed out in the comment above, I am saying that after countries reach a higher GDP level, CO2 emissions PER CAPITA stabilize or decrease. I really don't appreciate your false insinuation that I am deliberately or accidentally misrepresenting the paper. Expressing the results of the paper is only appropriate on a PER CAPITA basis. You are also apparently unaware that many high GDP countries are losing, not gaining population, and that these trends are expected to increase over the 21st century.